Here's my take on food waste. 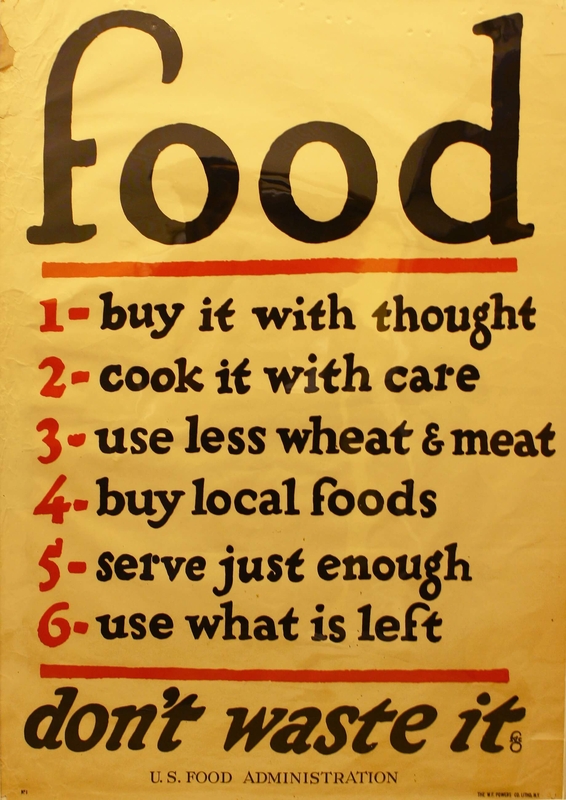 It goes back in part to lessons I've learned from studying World War I, when the American government set food conservation goals (along with goals for local food production via Liberty - later Victory - Gardens). I'm a big proponent of both reducing food waste and producing more food in communities via school, home and community gardens. Big point: the World War I poster included in this post has advice we'd be well served to heed today. "Food waste is both an ethical and environmental issue. It should concern us that we waste nearly 40 percent of the food we produce and purchase in this food-abundant nation. For an interesting comparative statistic, consider this: our nation produced nearly 40 percent of the fruits and vegetables we consumed on the American home front during World War II in school, home, community and workplace gardens." It's an iconic poster from World War 1. Food...don't waste it. The image is regularly shared on Twitter and Facebook. The original was produced in 1919 by the United States Food Administration, under the direction of the newly appointed food "czar" - Herbert Hoover. The poster was reissued during World War II. It's been revised in recent years, by individuals and organizations interested in encouraging an ethos incorporating local foods and sustainability. The First World War marked the first large-scale use of propaganda posters by governments. Posters, with easy-to-understand slogans and compelling images, made powerful propaganda tools. The government needed to shape public opinion, recruit soldiers, raise funds and conserve resources and mobilize citizens to important home front activities ... including gardening, food conservation and food preservation. In an era before television and widespread radio and movies, posters were a form of mass media. And they appeared in windows and were posted on walls everywhere, in as many languages as were spoken in this nation of immigrants. If you want to dig a little deeper, the poster art of WWI was influenced by the La Belle Epoque - the beautiful era - named in retrospect, after the full horror of WWI had been revealed. The Art Nouveau movement in France and the rise of modern advertising were also important in shaping how posters were used during wartime. Technical improvements in printing, including a process called chromolithography, facilitated mass production of posters. The original poster has six rules that we'd be well served to follow today. The fourth rule - buy local foods - is somewhat of a surprise to people today, because the notion of buying local seems somewhat modern. But in WWI, the U.S. government encouraged the local production and consumption of food, in part, to free trains to more effectively ship troops and war materiel. UC Agriculture and Natural Resources (UC ANR) hosts a UC Master Food Preserver Program. The program teaches best practices on food safety and preservation to volunteers. 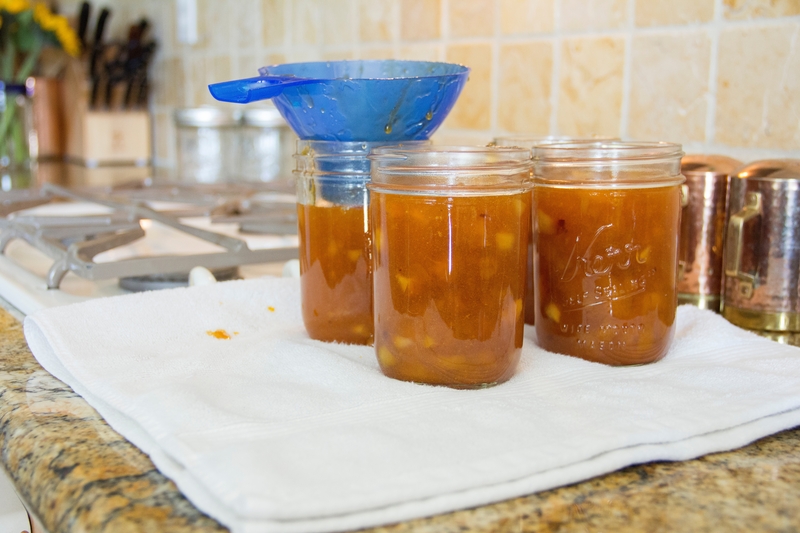 The extensive training program prepares the volunteers to work in their community educating others on the safe practices of food preservation, including pickling, drying, freezing, canning and fruit preserves. UC ANR also has the UC Master Gardener Program, which fields more than 5,000 volunteers in communities across the state. The Master Gardener Program is a national program, housed at the land grant institution in each state, but it's also connected to the USDA. Free gardening resources are available here. Advice to grow by...just ask. This is an excerpt of an article from a post on the UC Food Observer blog, used with permission. Last week, UC ANR hosted a one-day Global Food Systems Forum. Providing 8 billion people with quality, affordable and accessible food is the defining economic, sociopolitical and ethical issue of our time. It is a global challenge. But it is also a challenge to California, one of the world's top agricultural producers. UC was proud to provide the opportunity for discussion around this vital topic. 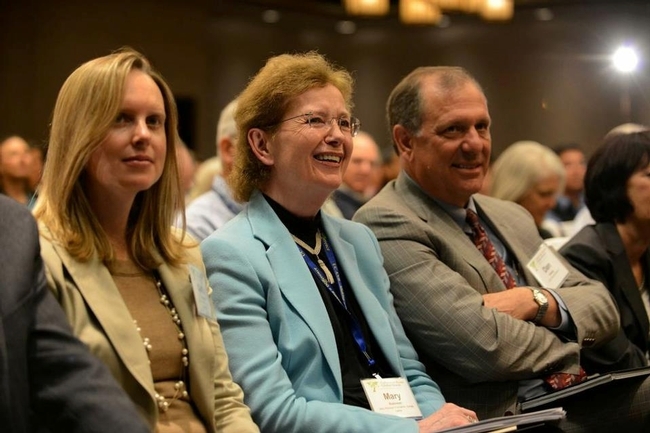 Former Ireland President Mary Robinson, center, with Dan Dooley, senior vice president for external relations, UC Office of the President, and another conference participant. The keynote was offered by the former president of Ireland, Mary Robinson. Robinson spoke eloquently of food as a human right, and described inequalities in the food system. Her opinion is that climate change will increase inequalities and human suffering, and that the effects of climate change are already being felt acutely in some parts of the world. She also spoke about the role of women in food production, and the need to provide equitable educational opportunities for girls throughout the world. Ms. Robinson’s talk was followed by a global food panel that tackled a number of issues, including GMOs, water, poverty, food access and human health. Lunch comments were offered by sustainability leader Wes Jackson, of the Land Institute in Salina, Kansas, where biodiversity in agricultural production is stressed. California is a key player in the global food system, and the afternoon session was devoted to discussing issues relating to California. Institutions, including UC and the USDA, were represented; producers also participated. The participation of young people involved in the food justice movement added vibrancy to the discussion; theirs is the generation that will fully feel the effects of the decisions we make today. 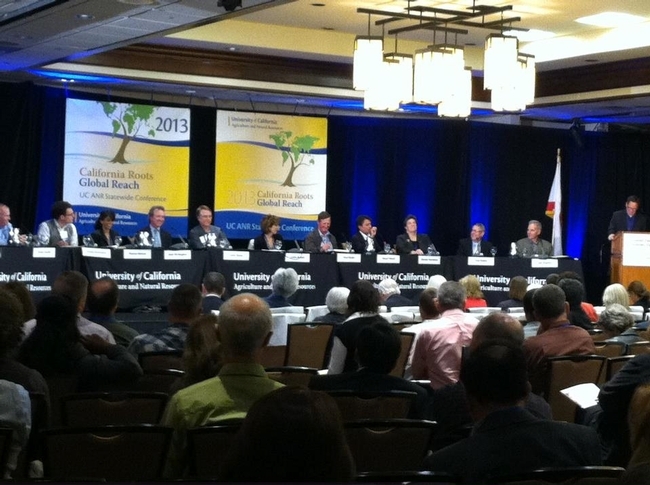 While consensus was not reached on every issue, some thoughts about California agriculture emerged. We are innovative, we are vital to the national and global food supply, and what we do here matters. The event was streamed live across the world, and several hundred people participated in the conversation via social media, under the hashtag #food2025. At one point during the afternoon, the topic trended #3 on Twitter's United States feed. The diversity of participants in the discussion reflected the diversity of issues and challenges facing all of us. Additional information about the program and speakers is available. The link to the broadcast is located at http://food2025.ucanr.edu/webcast. We hope that you’ll watch the broadcast, and add to the conversation. It’s one worth having, and one in which we all have a stake. The 2008 Farm Bill provided more support for local and regional agriculture. 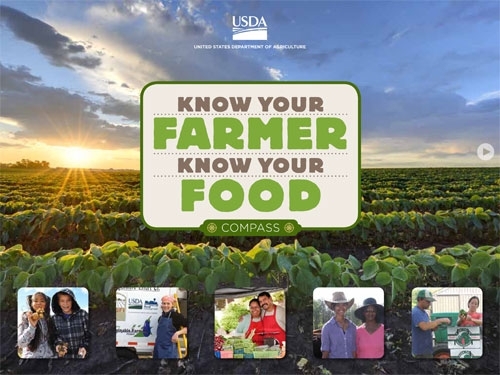 In 2009, under the leadership of deputy secretary Kathleen Merrigan, the USDA launched its Know Your Farmer, Know Your Food initiative, with an eye towards doing just that. The list of initiative goals is lengthy, but include promoting, locally and regionally produced and processed foods; expanding access to affordable and fresh food; and demonstrating the explicit connections between food, agriculture, communities and the environment. Know Your Farmer, Know Your Food is a USDA-wide effort. It is not a new department, but rather, an effort that seeks to more effectively connect existing USDA departments and work to strengthen local and regional food systems. We know that demand for local and regional foods is strong. Per USDA statistics, the number of farmers markets has more than tripled in the past 15 years and there are now more than 7,175 around the country. The community supported agriculture (CSA) model has grown from 2 operations in 1986 to more than 4,000 today. Farm-to-school programs have experienced explosive growth, and are now found in 48 states, and total more than 2,200 (per the USDA, there were two such programs in 1996). There are “branding” efforts touting what is produced “locally” (or regionally, or statewide) in each of the 50 states. These efforts are important: local and regional food efforts are vital to local economies, as they can often provide farmers with a higher share of the food dollar. Local jobs are supported and created in this manner, as money spent at a local business often continues to circulate within the community, creating a multiplier effect. Food dollars are good dollars. One of my interests is food access. The site did not fail to satisfy me in this respect. The food environment atlas tool enabled me to construct a spatial overview of the ability of specific communities to access healthy and fresh foods. In very short order, I was able to construct a rough demographic overview of how my county measured up in terms of residents’ access to grocery stores, the prevalence (and growth) of fast food restaurants, etc. This information could then be compared against other communities (or in my case, adjacent counties). 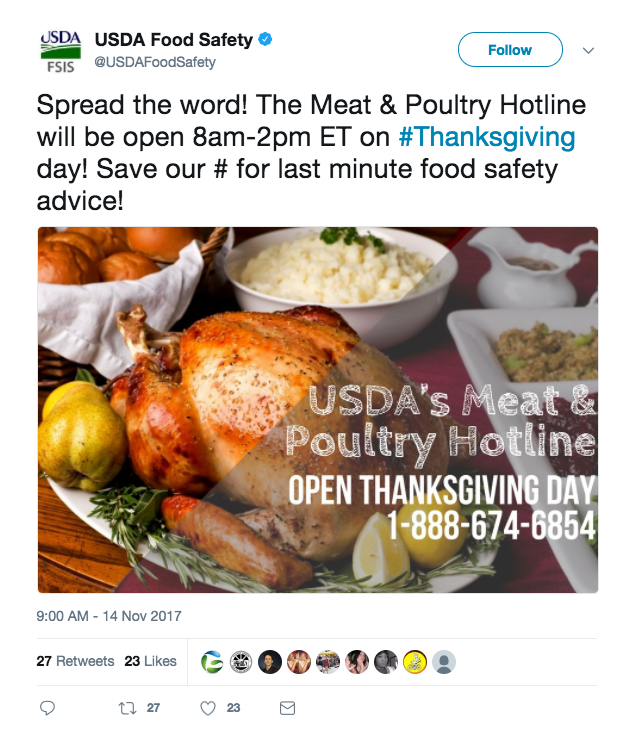 This tool, along with other USDA food access tools, will prove invaluable to site users (including social science researchers). The USDA’s Economic Research Service produces some of the most cutting-edge and valuable research in this area; the site makes this information even more accessible. The site also provides ways consumers can more directly connect with producers, a key part of building and sustaining local and regional food economies. The Compass explicitly links food and agriculture, and shows just how interconnected the food system is with the economy, the health of communities, and the larger environment. President Obama recently said, “Local food systems work for America: when we create opportunities for farmers and ranchers, our entire nation reaps the benefit.” The Know Your Farmer, Know Your Food initiative continues to grow, to improve and to support this vital sector of our nation’s food system. 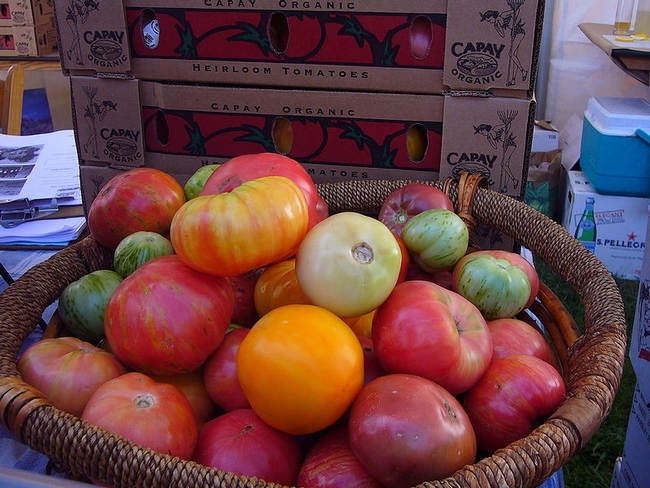 Heirloom tomato cultivars - which can be found in a wide variety of colors, shapes, flavors and sizes - may not be practical for commercial production, but add interest to home gardens. On this Winter Solstice, the longest night of the year, it’s nice to sit with a cup of tea and a seed catalog, dreaming about a spring and summer garden. For 2012, I’ve decided to focus on heirloom varieties for my home garden. Spoiler alert for my family: there are packets of heirloom seeds tucked in your Christmas stockings, with extras for Memere and Pepere (who are grandparents and also grand gardeners). “Heirloom” is an interesting term, and like the word “sustainability,” it means different things to different people. Recently, I read The Heirloom Life Gardener, a book written by Jere and Emilee Gettle. The Gettles are the co-founders of the Baker Creek Heirloom Seed Company, which publishes a lush and incredibly informative seed catalog and has spun off a variety of gardening-related enterprises across the nation. The Gettles define heirloom seeds as being “nonhybrid and open-pollinated” and as usually having been in circulation for more than 50 years. Some heirloom seed types currently in use could have been found in Thomas Jefferson garden at Monticello. Some appear more recently, during the Great Depression, including the Mortgage Lifter tomato (who couldn’t use one of these in today’s economy?). The term “civic agriculture” - coined by the former Thomas Lyson of Cornell - is used by some to refer to the movement towards locally based agricultural models that tightly link community, social and economic development. Models of civic agriculture include CSAs, farmer’s markets, roadside stands, urban agriculture, community gardens, and farm-to-school/farm-to-institution programs. I also argue that civic agriculture includes school and home gardens . . . any place where people seek to connect land to the development of community or as an expression of engagement or citizenship. The civic aspect of agriculture is much older than the current local food movement; it hearkens back to our nation’s founding. The connection between land and democracy has always held real meaning in American culture. Jeffersonian ideals about the civic virtues and value of gardening and agriculture were prevalent and shaped American cultural and political life; the U.S. Department of Agriculture, created in 1862, was called “The People’s Department” by President Abraham Lincoln. Lincoln once told a group of Wisconsin farmers that as long as Americans knew how to cultivate even the smallest plot of land, that the nation’s citizens would be free from kings and moneylenders, free from oppression of all sorts. Federal legislation such as the Morrill Act (we will celebrate its sesquicentennial in 2012, and I'll be writing about that throughout the New Year) created America’s land-grant institutions, which still have as a primary purpose research and education in support of the nation’s agricultural producers. (Land-grant institutions through their Master Gardener programs also support home and community gardeners). The Homestead Act, also passed in 1862, and linked the cultivation of land to the protection of the Union and the expansion of democracy during the nation’s Civil War. You’ve heard this from me more than once: We were a nation of farmers at origin; we are still a nation of farmers at heart. We farm, and we garden. Gardening links the myth and the practice of agriculture to one another. In practice, gardening is agriculture on a personal scale; it represents an individual's relationship to a specific piece of land. This is a kind of relationship worth investing in. As the longest, darkest days of the year are upon us, as you celebrate the best things that family and hearth offer, and as you formulate your goals and hopes for the New Year, I hope that you’ll consider adding another resolution to your list: to embark upon a gardening activity, no matter how small, in 2012. Occupy the possibilities that gardens create at our homes, and in our communities. Happy Holidays, and a Healthy and Prosperous New Year.